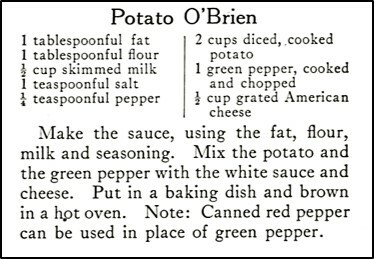 When browsing through hundred-year magazines, I came across a recipe for Potato O’Brien. 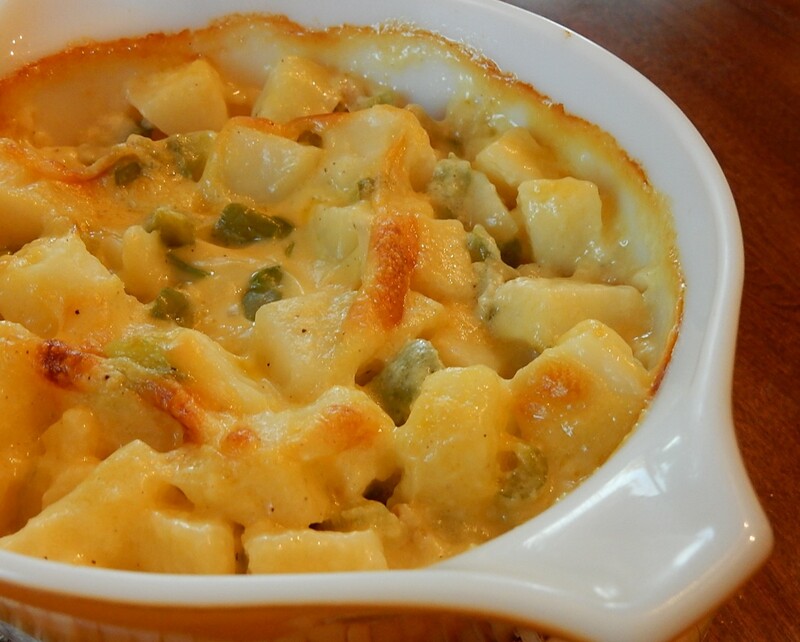 Diced potatoes (that are first boiled) and green pepper are immersed in a hot and bubbly mild cheese sauce. The dish is then browned in the oven. This version of Potato O’Brien is a little different from most modern recipes (which generally call for frying the potatoes), but it’s delicious. It reminds me a little of Scalloped Potatoes, but with cheese and green peppers. After the official invention of processed cheese in 1911, and its subsequent popularization by James L. Kraft in the late-1910s and the 1920s, the term “American cheese” rapidly began to refer to this variety, instead of the traditional but more expensive cheddars also made and sold in the US. Apparently by 1918, American cheese was commonly enough available that it was included in recipes published in magazines. It’s also the first hundred-year-old recipe that I’ve ever seen that called for skim milk. I’m not clear to me why skim milk is preferred in this dish, so when I updated the recipe I just listed milk as an ingredient. Peel and dice the potatoes into 1/2 inch pieces. Put diced potatoes in a saucepan and cover with water. Put on high heat and bring to a boil; reduce heat and simmer until the potatoes are tender (about 10 minutes). In the meantime, in a skillet, melt butter using low heat. Add the green pepper; saute until tender, and then stir in the flour, salt, and pepper. While stirring constantly, slowly pour in milk and bring to a boil over medium heat. Add cheese, and stir until the cheese is melted. Gently stir in the cooked potatoes. Put into a baking dish and place in the oven. Bake until the top is lightly browned (about 20 – 30 minutes). One teaspoon of salt seemed like a lot to me, so when I updated the recipe, I used less salt than was called for in the original recipe. I also sauted the green pepper in butter, rather than cooking it separately first. When there are cheaper foods that can take the place of Irish potatoes, why do we worry over their increasing cost? Besides, mankind has not always had potatoes to eat. The potato became widely popular only about one hundred years ago. It was the middle of the sixteenth century that the Spaniards found the potato in Peru and took it back to the Continent where it was cultivated as a curiosity. In our own country we know the potato was cultivated in the temperate sections, for we have record of Sir Walter Raleigh’s taking it in 1585 from North Carolina to Ireland, to be cultivated on his estate near Cork. Its cultivation first became general in Ireland (whence its name) and not until a little more than a century ago did it come into widespread popular usage. Certainly we are not wholly dependent upon the potato for a well-balanced dietary since our ancestors thrived without it. 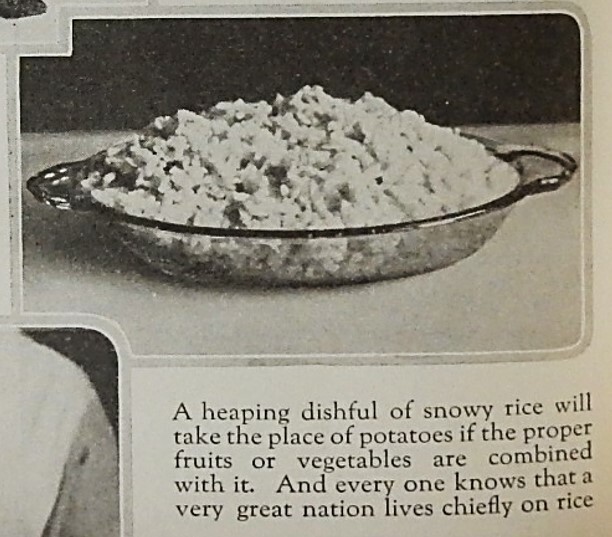 To be sure, the potato has justly soared its popularity because of its cheapness, its food-value, its palatability, the convenience with which it can be shipped and stored, and the ease with which it can be prepared in a surprisingly large variety of attractive ways. It is true that men and women are largely creatures of habit, but the time has come when the women, as controllers of at least seventy-five percent of the incomes of the men of the nation, must look to our habits to see whether they are expensive and whether they need to be altered. 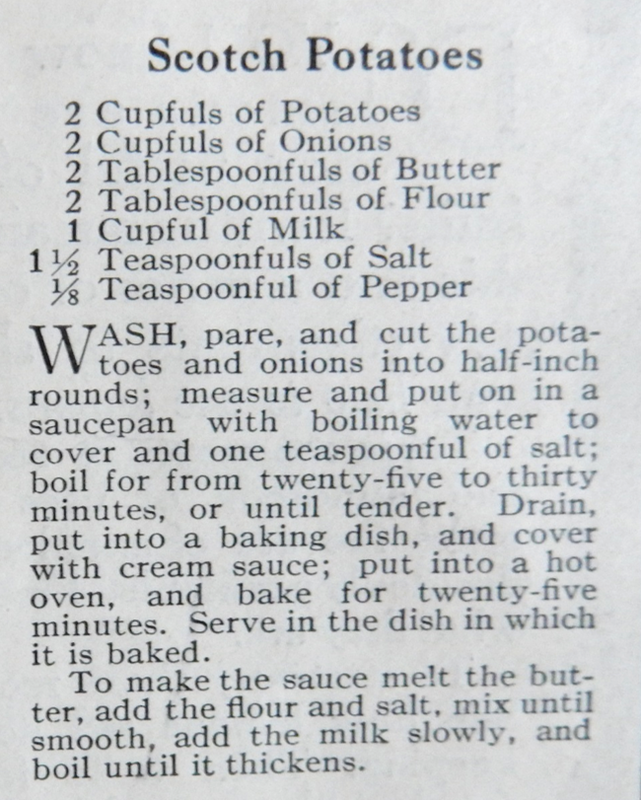 Starch is not the only necessary constituent of a substitute for potatoes. The potato is rich in vitamins. This property, however, is possessed by most fruits and vegetables, and by milk. Rice would more than fit the bill, as it contains nearly three times as much energy-building material as the potato. If we substitute it for potatoes, me must have at the same meal vegetables or fruits that will supply the needed potassium and bulk. Such vegetables and fruits are: Cabbage, cauliflower, asparagus, cucumbers, beets, lettuce, celery, string beans, parsnips, rhubarb, rutabagas, spinach, tomatoes, turnips, bananas, apricots, lemons, oranges, peaches pineapple, strawberries. In purchasing rice we have a chance to economize by buying the broken kernels, which sell for several cents a pound cheaper than the whole grain, and have exactly the same food value. Not that we wish to taboo potatoes–far be it from that–but since their price is relatively high we can save money by using potato-less menus. Wednesday, March 13, 1912: Nothing of much account did I do today. Since Grandma didn’t write much a hundred years ago today, I’m going to give you another old recipe. This one is for Potato Cakes, and it’s a great way to use left-over mashed potatoes. When I was a child we frequently ate Potato Cakes. My memory is that they were a very traditional Pennsylvania food—and I can picture Grandma eating them when she was a teen. I hadn’t made Potato Cakes in years until I decided to make them for this post. I don’t have a written recipe—but this is how I made them. After the meal where the mashed potatoes were served, take the left-over potatoes, shape into flat patties and press firmly. Put on a plate, cover and refrigerate. Will keep for several days. When ready to make the Potato Cakes, melt enough shortening in a heavy frying pan to cover the pan to a depth of about 1/8 inch. Slip the patties into the hot shortening. Fry until golden brown; flip and fry on the other side. Remove from pan and drain on paper towels. Serve immediately. The amounts are very flexible. 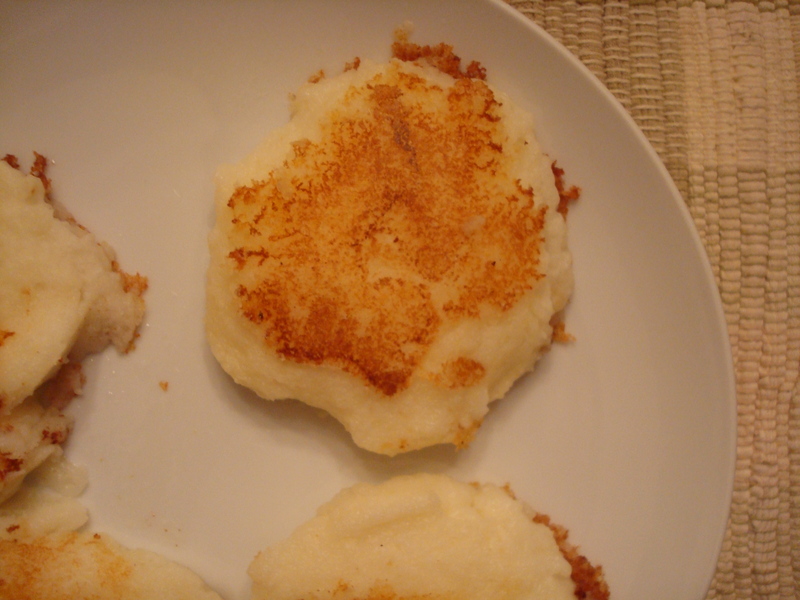 When I made the mashed potatoes, I made more than I typically would—and then I just used all of the left-over potatoes to make the potato cakes. The Potato Cakes turned out great. My husband and I enjoyed eating them, and I’m planning to make them again in the near future. Tuesday, January 16, 1912: There is nothing much to write about for today. Things go on as usual. Since Grandma wrote little a hundred years ago today, I’m going to give you the recipe for an old winter staple–fried potatoes. 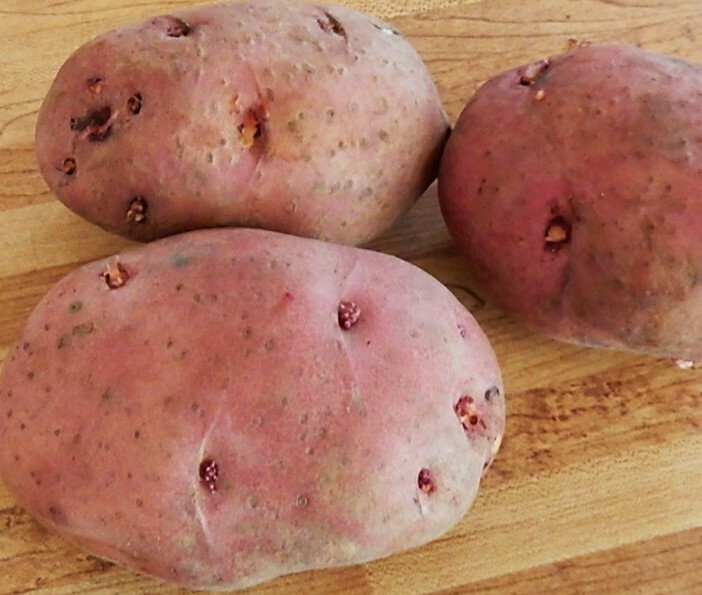 Potatoes and other locally-grown vegetables that could be stored for many months were an important part of the winter diet. 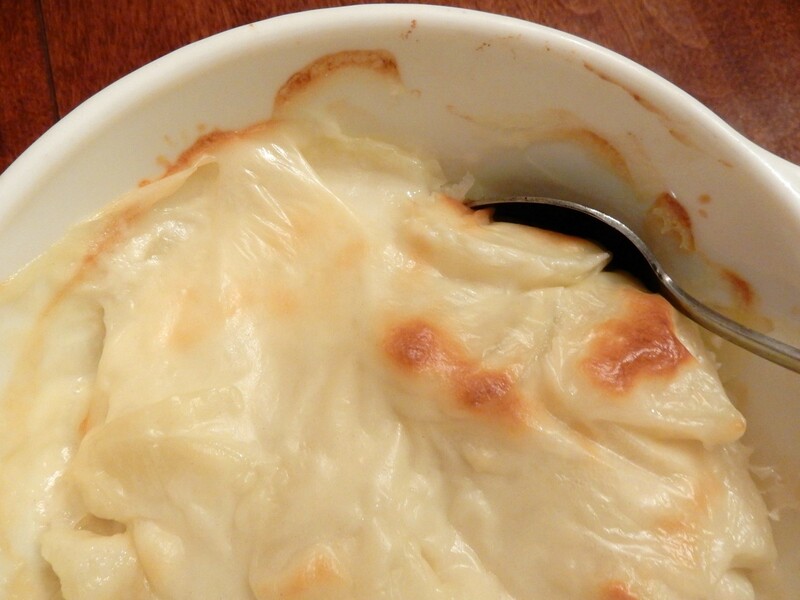 Melt lard in large heavy skillet (preferably cast iron) using medium heat. When the lard is hot add the sliced potatoes. Generously sprinkle with salt. 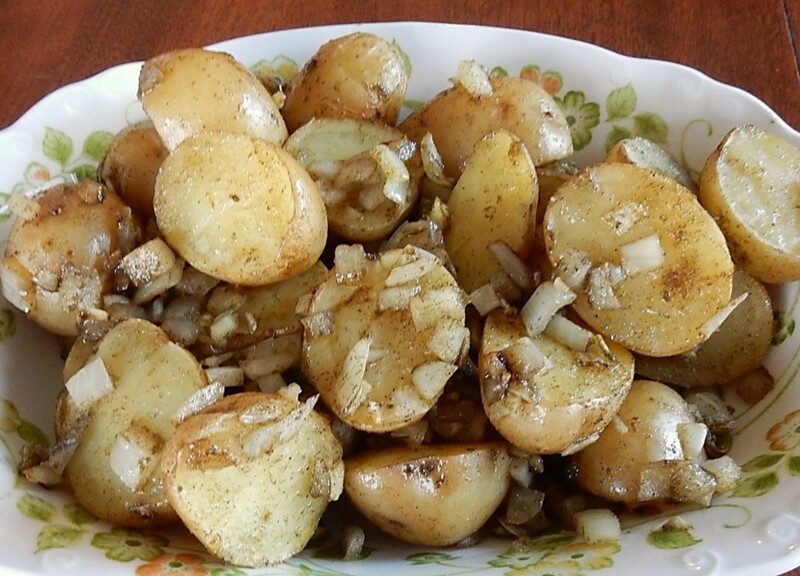 Turn potatoes with a spatula and again sprinkle with salt. Continue cooking (and occasionally turning) until potatoes are tender, with a crisped, lightly browned coating. 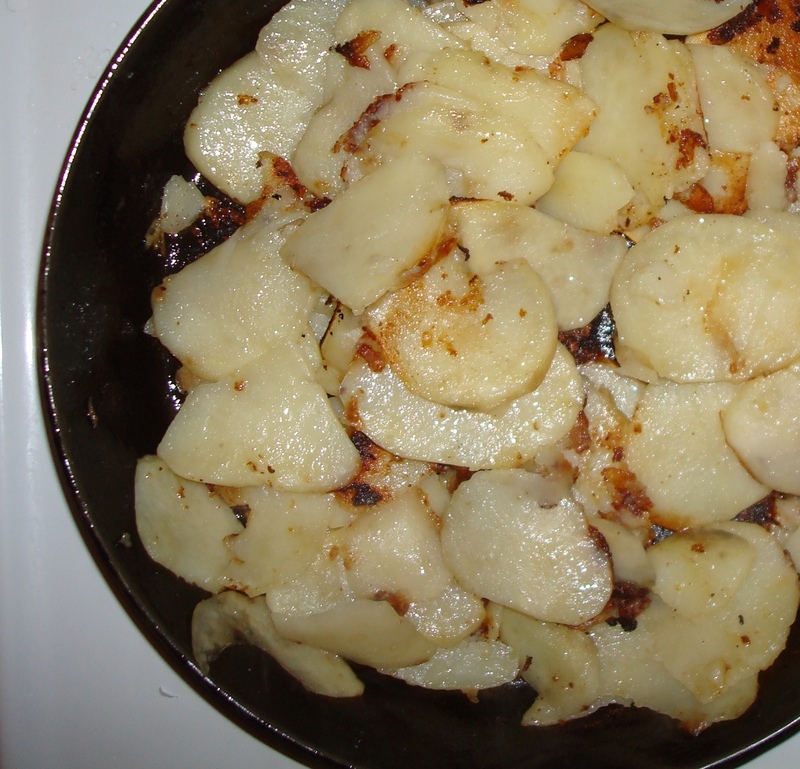 Old-fashioned fried potatoes cooked in a cast iron skillet are one of my favorite foods. They brown beautifully and are very crisp. And, the lard really enhances the subtle flavor of the potatoes.